John Bryan is expected to run for Fine Gael in the European elections this summer. 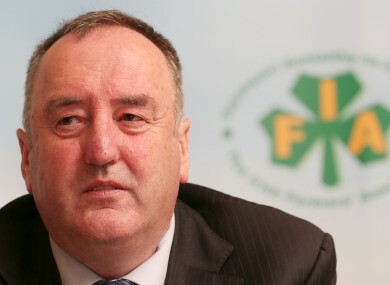 THE OUTGOING PRESIDENT of the Irish Farmer’s Association (IFA) has voiced his interest in contesting the European elections in May. It is believed he will run as a Fine Gael candidate in the expanded the Ireland South constituency, telling TheJournal.ie that it is something he had been approached about. Fine Gael already has one MEP in the region with Seán Kelly set to defend his seat in the European Parliament and the party looking to add a second. However, Bryan said that he was “still on the job” at the IFA as he is due to finish up as the organisation’s president next Tuesday. “I have always said that it is something that I was very interested in once my term as president at the IFA is over. I always said I was never going to finish up and just sit on my hands,” he said. He added that he felt that he had a lot to offer a role in Europe stating, “as IFA president, you get a massive amount of experience about how Europe operates, which I think stands to me and means I have a lot to bring to a role Europe”. Bryan went on to say that Europe can be a “very bureaucratic place” especially for people who have not dealt with the everyday workings of the Council and Commission, he said. “For the past number of years, I have headed up talks on the CAP deal for farmers, which involved a lot of discussions, talks and meetings with different farming groups from all over Europe. “I believe I have a huge amount of experience to offer the role – skills that are second to none to some people”. He added that there was a number of farming issues that needed to be highlighted in Europe, but said there are also a number of non-related farming matters to be tackled also. “Running in the European elections has always been something I have been interested in,” Bryan said, however he added, he still had a job to do at the IFA and said he deliberately did not want to begin talking about one job before he was finished up another. Bryan’s likely candidacy will likely bring an end to hopes that Wicklow TD Simon Harris had of running in the same constituency for Fine Gael as the biggest party in the State targets five of the 11 Irish seats including two in Ireland South. It’s also been suggested that Senator Deirdre Clune, a former TD for Cork South-Central, could run. Email “Outgoing IFA president says he has the skills for MEP job”. Feedback on “Outgoing IFA president says he has the skills for MEP job”.